PracticeLink.com W INTER 2019 41 features t H e Q UAL it Y OF Li F e i SSU e ▲ ▲ ▲ LAURIE MORGAN I F Y ou ' R e l I K e M o S T N e W P h Y S IC I A NS embarking on your career, you might not be thinking ahead to a management role. Your priorities are likely finding the right place to practice and, above all, helping patients. But even if you don't envision running a health system, hospital department or independent practice in the future, you should still be seeking out opportunities to develop leadership skills. These abilities will bolster your career as a physician —whether you see yourself in a corner office one day or feel certain you'll always focus on patient care. 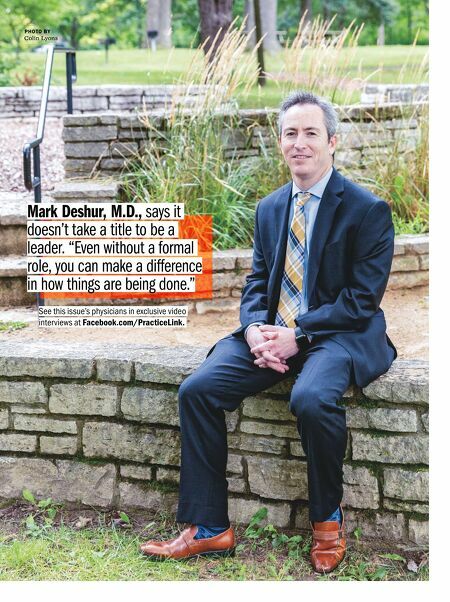 After all, some level of leadership is inherent in every physician role. Staff will look up to you and expect you to lead the way, and your employers will rely on you to guide new initiatives and solve problems. Learning to lead better can help you not only advance your career but also care for patients more effectively. Filling a gap in your medical training Despite their benefits, leadership skills rarely get attention in medical school and residency. With so many clinical priorities to cover, it's hard to make room for non-clinical topics in the curriculum. 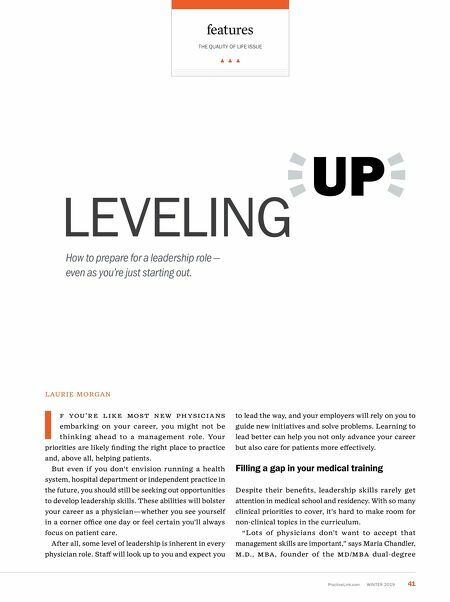 "Lots of physicians don't want to accept that management skills are important," says Maria Chandler, M.D., M BA, founder of the M D/M BA dual-degree LEVELING UP How to prepare for a leadership role — even as you're just starting out.